The Sienna Plan under construction on Lot 4 offers 12 ft. soaring ceilings on the first floor and 10 ft. on second floor, two master suites and a one car garage. Beautiful beach home with four bedrooms and 4 baths and a powder room. This home would make a great full-time, vacation home or rental with a master suite downstairs and up. Stainless steel appliances, gas cooktop stove, granite countertops, tile in baths and laundry, wood floors in main living areas, master bedroom downstairs, media room, second floor hallway and stairs. Tankless water heater, gavalum metal roof. THIS HOME IS UNDER CONSTRUCTION. Estimated completion by end of October.There are three public beach accesses within about a mile of the neighborhood with paved parking and restrooms. Blue Mountain is less crowded than other parts of 30A, so easy to get around on bikes and golf carts. Also, The neighborhood has trails that lead out to the State Forest trails. Neighborhood amenities include a large resort style pool, large hot tub, gas fire pit, pavilion with comfortable couches, chairs, and tables; gas grills, ice maker, sink, big screen TV, and stereo system for entertaining. The neighborhood has some nice elevation with rolling hills and even has an observation tower at the pool to take in the sunset views of the Gulf of Mexico, and the expansive state forest views. The HOA is planning to gate the community soon, and already offers a security company that patrols the community and pool area. 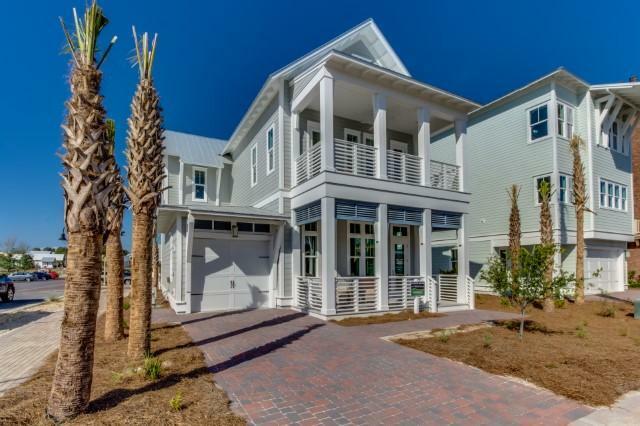 Don't miss out on one of the nicest neighborhoods on 30A. Photos shown are of the Sienna model at The Town of Prominence, and this home will have similar colors and finishes. The home on Lot 4 in Highland Parks will also have raised porches giving a nice elevation to the home.